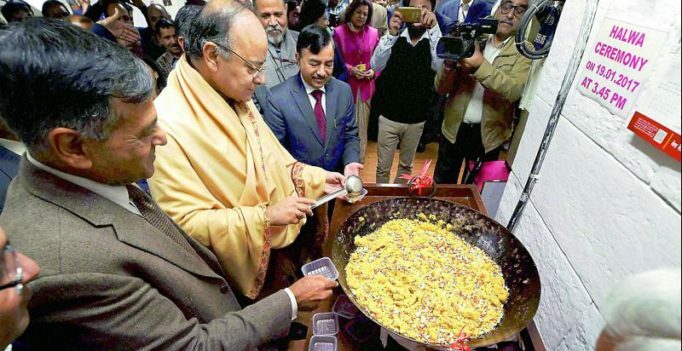 New Delhi: Even as the Election Commission is yet to give a verdict whether Union budget could be presented on February 1, Finance ministry kicked off the process of printing of budget on Thursday with the traditional halwa ceremony at the North Block. After the Halwa ceremony, more than 100 officials of finance ministry will stay in Budget Printing Press in North Block till Union finance minister Arun Jaitley budget speech is over. Budget Press in North Block houses all these officials in the period leading up to the presentation of Union Budget in the Parliament by the Finance minister. This is to maintain complete secrecy about the budget. These officers will gain touch with their near and dear ones only after the Union Budget is presented. Even journalists are banned from entering finance ministry during this period, except when some important announcements are to be made. The annual budget is prepared by the budget division of Department of Economic Affairs (DEA) headed by the joint secretary (Budget) of the Ministry of Finance. To start the process, the budget division issues an annual budget circular every year. The opposition parties had written to the President and the Election Commission objecting to the presentation of the Union Budget on February 1 ahead of the Assembly elections in five states and demanded that the government be asked to defer the annual exercise. Meanwhile, Election Commission has sought fresh details from the Cabinet Secretariat, including the procedure followed by the government to delay the presentation of the Union Budget in 2012. In another letter to the Cabinet Secretariat written on Wednesday the Commission has asked for a response by tomorrow morning, sources said. The poll watchdog has also sought details on the process involved in preparing and presenting the Union Budget.